The Lake County Republican Federation will be raffling off a Mossberg 500 shotgun on Friday. There is no truth to the rumor, though, that the winner will be chosen with a spin of a russian-roulette wheel. Lake County Republicans are moving ahead with a fundraiser where at least a dozen firearms will be given out to donors Friday night, less than two weeks after the deadliest mass shooting in modern U.S. history in Las Vegas. 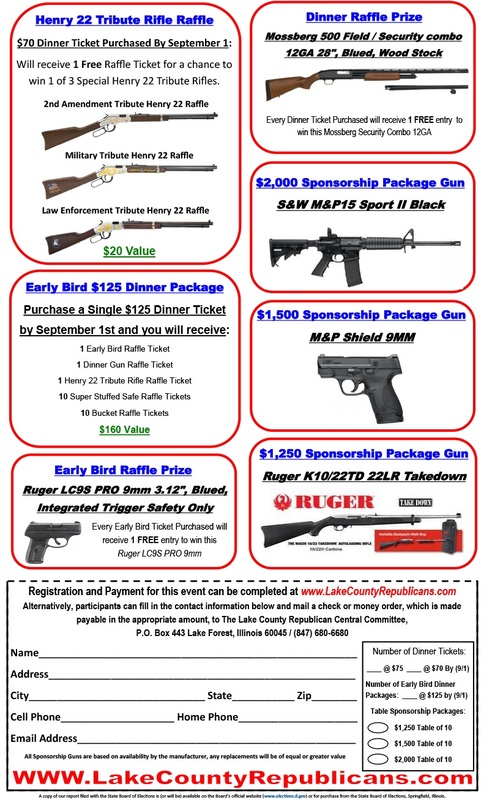 The "Lake County Republican 2nd Amendment Dinner & Gun Raffle" in northwest suburban Kildeer features an AR-15-style semi-automatic rifle for those who pay $2,000 to sponsor the event, raffles for a 12-gauge shotgun and a 9 mm handgun, and other gun-related packages. One military analyst observed: "That's enough firepower to launch a ground assault on Pyongyang!" While in outward appearance a gun show, the GOP fundraiser, from a legal perspective, is a dinner event. One source showed your LakeCountyEye a menu. "Be sure to sample the stuffed shells in the bump stock broth. To die for!" The cash bar is open at 5:30 PM. Innocent bystanders are asked to steer clear of Lake County the night of the event.